Add a pop of color to your dinner plate with Steamin’ Greens®! We teamed up with our brand partner Salad Savoy Corporation to bring you this quick and easy recipe for Steamin’ Greens®. Salad Savoy Corporation is the home of color, taste, and nutrition®. Their product Steamin’ Greens® combines bite-sized pieces of two of their most colorful and delicious produce items, Salad Savoy® and Bright Lights®, into one convenient package. Steamin’ Greens® is the perfect choice when you’re short on time but still want to prepare a beautiful and tasty dish. Steamin’ Greens® is a combination of Salad Savoy® and Bright Lights® so let’s take a minute to talk about what those two products are. Salad Savoy® is a relative of kale and cabbage and grows in bright white and violet heads. Bright Lights® is a leafy green vegetable not unlike swiss chard, except that it comes in a range of colors including orange, pink, red and white with deep green leaves and colorful veins. Packed in a poly bag, Steamin’ Greens® loose leaves are ready to cook or serve right out of the bag! 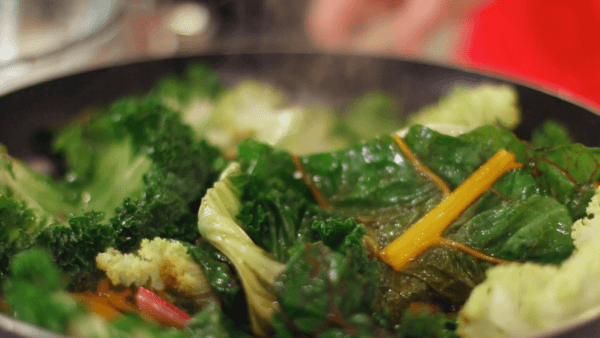 How can I use Steamin’ Greens®? Like all of Salad Savoy Corp. products, Steamin’ Greens® is versatile and can be used in multiple ways. Keep a bag on hand to jazz up pasta, salad, or soup. The following recipe is a basic preparation of Steamin’ Greens® that can be served as a side dish or on top of a protein like chicken or steak. An easy, classic preparation of Steamin' Greens® from Salad Savoy Corp.
Add Steamin' Greens to a large skillet. Add balsamic vinegar and olive oil. Saute for 5 minutes, stirring occasionally. Add a splash of water and cover skillet with lid. Simmer for 8 minutes. Add chopped garlic, onion, and/or bacon if desired. Serve immediately. How will you serve Steamin’ Greens®? Let us know in the comments below.